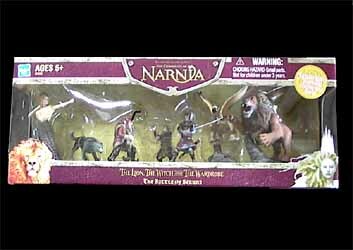 The Battle of Beruna set brings together a pretty impressive collection of action figures from the new The Lion, the Witch and the Wardrobe movie. In total there are seven action figures (The White Witch, Edmund, Aslan's Red Dwarf Fighter, Aslan, Griffon, Maugrim and Ginarrbrik) as well as a small piece of scenery - a section of rock with a tree stump, which can be used to rest the Griffon on. This set represents great value for money. 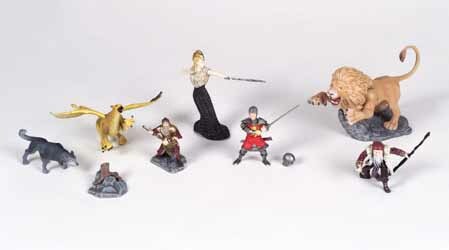 Each figure works out at just over £2.50. When you consider that you can buy unbranded, cheap, general figures for the same price, Disney are practically giving these figures away. The attention to detail on each figure is also worthy of note. Each looks like it's been carefully hand painted by a Warhammer fanatic - you know, those people that spend hours painstakingly painting those little metal figures. If you look carefully, you'll notice that the paint work is amazing (no unskilled workers hurriedly slapping on the paint here). Another added benefit is the fact that the weapons and parts of the armour can be removed. If you're looking for a quality toy, then you won't be disappointed. This is sure to be a hit with children and serious collectors alike.